This week marks the 20th anniversary of the death of Princess Diana and her paramour Dodi Fayed in a car crash in Paris. The day after her death I had a lunch appointment at the Carlton Club in St James’s Street, London. Walking down Pall Mall I was astonished to see a queue which went around the Mall, of the old, the young with babies in prams, and of every race and colour, many weeping on their way to sign the condolence book in St James’s Palace. In the following days, the mass show of emotion with a mountain of flowers building around Kensington Palace (Diana’s last home) and Buckingham Palace seemed to me inexplicable. The stoic and “buttoned up” England I had known since I came to Oxford and London in the early 1960s seemed now awash in tears. As Diana’s eldest son William said in a recent interview, grieving in public had been among the most difficult moments of his life. He said he had wondered of weeping members of the public: “You didn’t even know her, why are you so upset?” This summed up my feelings about the mass hysteria I had witnessed. Much worse, when the Queen, given her upbringing – when decent people did not express their emotions very strongly in public – stayed at Balmoral to allow her grandsons to grieve in private, it was considered a public relations disaster by the media and politicians. As Theodore Dalrymple (Spoilt Rotten: The Toxic Cult of Sentimentality) notes: “The tabloid newspapers carried out what can only be called a campaign of bullying against the sovereign”. Whilst the youthful newly elected prime minister, Tony Blair, “caught the mood of the emotional bullies perfectly: The deceased was the ‘People’s Princess’”, any questioning of her conduct or achievements was “to be an enemy of the people”. As Professor Anthony O’Hear soon found out, when in an article he suggested that “the princess had displayed “childlike self-centeredness” throughout her adult life, and that the public mourning after her death was symptomatic of a “culture of sentimentality”. He was roundly denounced by the tabloids, one of them calling him a “poisonous professor, a rat-faced, little loser”. The castigation of the absence of the royal display of emotion “suggested that it is the public nature of the expression of emotion that is most important. Emotions are now like justice: They must not only be felt, but seen to be felt.” This marks the rise of the Age of Sentimentality. For since the sages of the Scottish Enlightenment – Adam Smith in The Theory of the Moral Sentiments, and David Hume in A Treatise of Human Nature – overturned the past bedrock of Western philosophy — the primacy of reason in guiding human action, the role of the moral emotions (shame and guilt) in grounding morality has been recognised. As Hume wrote, “reason is and ought to be the slave of the passions” — a view confirmed by recent advances in the neurosciences. Neither god nor reason was needed to anchor morality. For Hume it was tradition, custom and social norms, using the moral emotions to internalise them, which made us moral animals despite out instincts. This is very much the view of ethics taken by the older Eurasian civilisations — the Indic and the Sinic. It was also the basis of morality of the paramount bourgeois capitalist society — Victorian England. For Adam Smith, in his Theory of Moral Sentiments, the “man of the most perfect virtue is who he joins, to the most perfect command of his own original and selfish feelings , the most exquisite sensibility both to the original and sympathetic feelings of others”. But he was at pains to distinguish this ‘sympathy’ from the “extreme sympathy with misfortunes we know nothing about”. This “seems altogether absurd and unreasonable… and those who affect this character have commonly nothing but a certain affected and sentimental sadness”. This sentimentality, I have argued in my Reviving the Invisible Hand, was a hallmark of the “Third Way” proponents such as Bill Clinton in the US and Mr Blair in the UK. This had followed the gradual demoralisation of Britain, which had overturned what till the 1960s had been the bourgeois Victorian virtues of work, discipline, thrift, self-help, and self-discipline, espoused by and large by the middle classes and the respectable working classes. The 1960’s Cultural Revolution was the final “coup de grâce” to the West’s traditional morality, aided and abetted by the growing entertainment and leisure industries. The traditional constraints on self-seeking and the self-discipline and self-control, which Hume and Smith saw as a necessary means to tame our baser instincts and create a good society, have been removed. In this new sentimental age, interlocutors in the media do not ask their subjects “what do you think” but “how do you feel”. It is particularly noxious in the public sphere. In education, the romanticists and sentimentalists have taken over the ideas of Rousseau that children are naturally good and can find their own way without discipline or explicit instruction. When my son at his primary school had not learnt to read after a few years, the teacher responded to my anxiety by saying that as long as there were books around he would pick up reading naturally. He had no answer to my response that my house was crammed with books. So we sent him to a specialist school where he was taught to read in the traditional way through phonics. Education, argue the sentimentalists, should be about play, and no censure should be allowed about performance, to protect the child’s self-respect. The apotheosis of this is the current movement on US campuses for “safe spaces”, with any instruction which would hurt the feelings of any group being censored. Similarly, the current movement to remove statues of various figures of the past because their actions do not fit current mores and morality is also part of the cult of sentimentality. 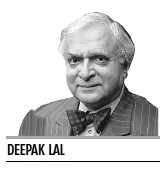 Fortunately, this damage to the West’s traditional morality through the cult of sentimentality has not spread widely in India outside the educated Western elite. It needs to be resisted.